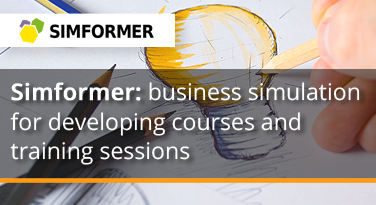 On the 15th and 16th of October, Minvydas Latauskas, Head of Product Development at Simformer, held two online seminars “Simformer: business simulation for creating courses and training sessions”. Gamification and the focus on fostering practical business skills are a growing market demand and a powerful trend in corporate training as well as academic environment. Developing training and educational programs on the basis of a business simulations will guarantee their effectiveness and popularity. Participants of the online seminar learned how to create innovative educational products based on a powerful multi-user Simformer Business Simulation. Minvydas Latauskas shared successful methods and technologies for creating practical educational programs as well as possibilities to promote educational products internationally through Simformer Platform. Get the additional information on the developing of courses and training sessions on the Simformer Platform by contacting us.